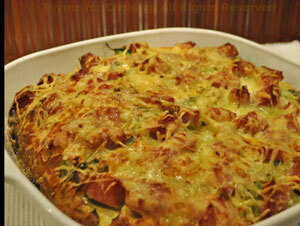 Thyme for Cooking simple Popover Pie, with Ham, Avocado, Spinach. Popover pies or savory clafoutis are a snap to make, and this one, with no advance cooking is particularly easy.... and delicious. Slice avocado into thin wedges. Thaw spinach, squeeze dry and chop if needed. Add milk, flour, salt and nutmeg. Beat lightly to just combine; a few lumps are okay - over-beating is not. Put olive oil in 10-inch glass baking dish and run it around to coat the bottom. Pour in 1/3 of the batter mixture. 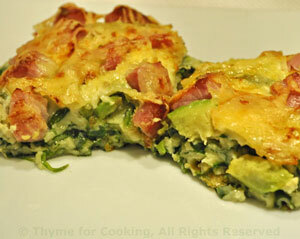 Spread spinach on top, then the avocado, herbs and and ham. Pour the remaining batter over all. Bake at 425F (215C) for 35 minutes or until edges puff up and are golden brown. Remove and let rest a minute or two.